Size Height 278 mm, width 200 mm. Watermark Pilgrim. Drake's identification: Watermark type 23. Drake's description: Crowned heald in circle 38mm. Watermark found in 1631-34. Found in manuscripts 1612-14 (floating body controversy), 1631-32 (note on Rosa Ursina). 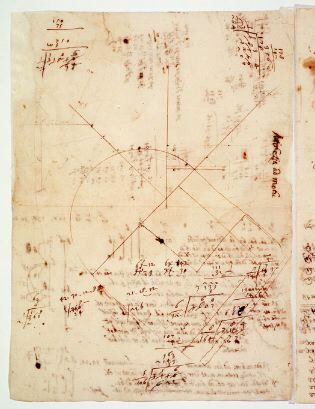 Comments Written by Galileo; contains drawing, calculations, minimal text, table.